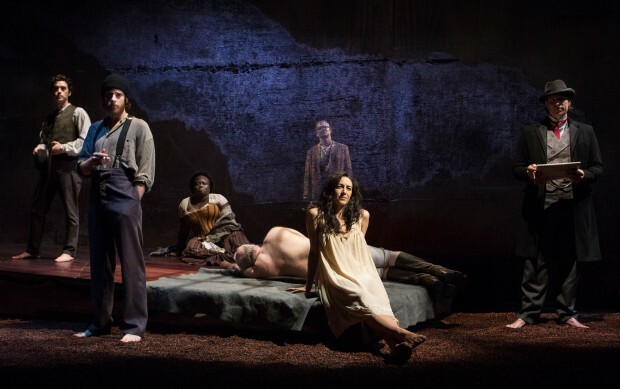 From left to right Jesse Aaron Dwyre, Jeff Lillico, Akosua Amo-Adem, William Webster, Matthew MacFadzean, Tara Nicodemo and Dan Chameroy are a lively bunch that give theatre a renewed purpose in the Soulpepper Theatre Presentation of ‘Farther West’ on stage until November 9. When an au naturel Tara Nicodemo as May Buchanen sits quietly beside her client in the opening scene of Father West, playgoers get the impression she hungers for life’s new chapter. And while the reflective woman of ill repute may not know precisely where’s she’s going, it’s a father’s advice to continue her migration beyond the mountainous passage that beckons her. May’s biggest problem is that she’s got what everybody wants—mind, body and soul—and walking away will prove easier in theory than it does in practice. Drunken horny men come, and drunken horny men go yet the free spirit’s greatest lesson to be learned is that the one you shoot in self-defense will ultimately come back to you as a keeper or a curse. Father West is a play of significant size and weight, shaped to upmost perfection by director Diana Leblanc and an responsive cast with both and the ability to project wondrous dramatic range. The end result feels like history in motion. Matthew MacFadzean’s Thomas serves as a dignified exit strategy for the flesh peddling heroine but fails to realize freedom cannot be purchased at any price. Dan Lett’s Babylon The Great obsessed Seward is a mesmerizing ticking time bomb whose motives are never fully understood until it’s too late. But the versatile Tara Nicodemo secures an impassioned performance capturing a resolute mindset with charm and deliverance. You can’t help but cheer for the May’s great escape to a destination with no rules and no law but fearful that the Promised Land of independence she seeks is sadly non-existent.